With some of the most spectacular golf course views along The Moorings Country Club, this 4,221-square-foot Knauf-Koenig-built five-bedroom (all en-suite), five-and-a-half bath gem is a shining example of what the Naples lifestyle is all about. Designed by Falcon Design, the open-concept one-story home features gorgeous detailing with warm Legno Bastone wide plank wood flooring under bright-white beamed ceilings that soar for a thoroughly modern Florida feel. 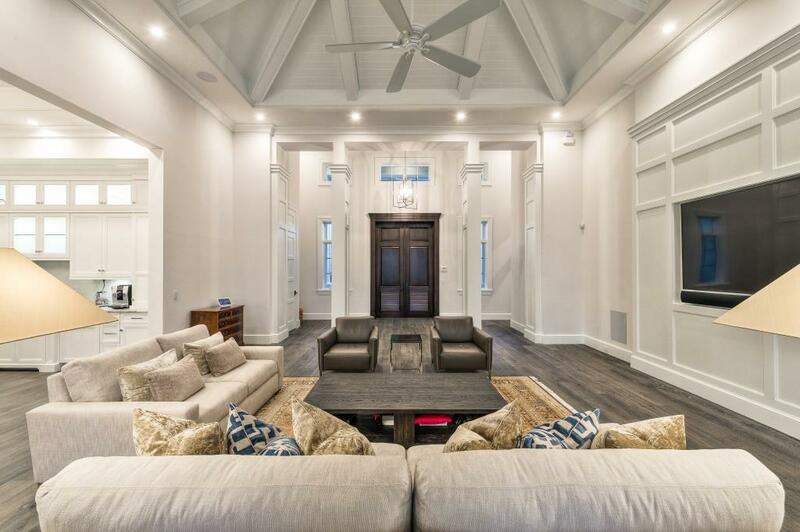 The great room features a dramatic 20-foot vaulted ceiling and 10-foot French doors, which lead out to the covered lanai, pool, spa and golf course. The sparkling white open kitchen includes Ruffino Signature Collections cabinetry under a tall, coffered ceiling; Wolf and Sub-Zero appliances; two dishwashers; and a generous walk-in pantry. An elegant dining area with contrasting Ruffino beverage bar makes the space perfect for everyday living as well as entertaining. In addition, the home has a full Control4 smart home system, which controls the six televisions (indoor and outdoor), sound system, lighting, window shades, security cameras, and front door bell, making this a truly smart home. The master bedroom, which also opens onto the stunning pool area, features a spacious closet/dressing room with Ruffino Cabinetry (guest bedroom closets feature California Closets). The gorgeous outdoor living area includes a gas-heated saltwater pool and spa, a beautiful outdoor kitchen, and a lanai area with fireplace and TV (which is protected by roll-down screens and storm shutters). Other notable amenities include indoor/outdoor ceiling fans and sparkling white plantation shutters throughout, and a generous laundry room with double washers and driers. This recently completed home is truly move-in ready. Knauf-Koenig Group has completed a home at 3120 Crayton Road in The Moorings neighborhood of Naples. Listed with Abbie Valentine of John R. Wood Properties for $3.925 million, the first open house was quite the draw as a steady flow of people toured the home. It is the latest of several luxurious residences built by the custom home builder in the highly sought after beach and boating community. The traditional coastal style home, designed by Falconer Jones of Falcon Design Inc., features five bedrooms, six bathrooms and a sprawling single level design encompassing 4,037 square feet under air and 6,079 total square feet. The open floor plan featuring Legno Bastone European oak wide plank flooring allows for effortless transitions from indoor to outdoor living; perfect for entertaining family and friends. The great room flows into the well-appointed chef’s kitchen featuring Sub-Zero and Wolf appliances, quartzite counter tops and Signature Collection custom cabinets by Ruffino Cabinetry. Just off the kitchen is a butler’s pantry with Bosch appliances and ample storage, as well as a wet bar with Sub-Zero wine refrigerator. The master suite's privacy and sophistication are enhanced by the home automation system that allows the roll- down shades to be controlled by the simple push of a button. The master bathroom, with driftwood finished custom cabinets, marble counter tops and a freestanding bathtub, has a spa-like feel to it. The four guest rooms all have en suite bathrooms and walk in closets, as well as ceilings featuring Knauf-Koenig Group’s signature wood work with decorative beams and tongue and groove. The covered lanai with a stained cypress tongue and groove vaulted ceiling is accessed by three sets of French doors in the great room or the Andersen sliding glass door in the kitchen. Retractable screens and shutters, summer kitchen and outdoor fireplace round out the outdoor living area surrounded by lush tropical landscaping and a pool and spa. Other features of the home include a custom mahogany front door by Davanti, Andersen 400 series windows and doors and custom designed doors for the three-car-garage. The third garage has all of the provisions to easily convert it into a detached guest suite. Energy-efficiency is abundant in this home with a top of its class tankless water heater, Lenox a/c units with variable speeds and high SEER ratings and spray foam insulation to keep the humidity and moisture out. Close to downtown and the beach, The Moorings has been a highly desirable area ever since its development in the early 1960s. Currently in a transition period, the area is receiving a face lift with many of the older homes being torn down down to be replaced with new residences. Each home in The Moorings is eligible for membership to the private beach park. For 20 years Knauf-Koenig Group has been building custom homes and has earned a reputation for excellence and quality. Visit www.kkgbuild.com. 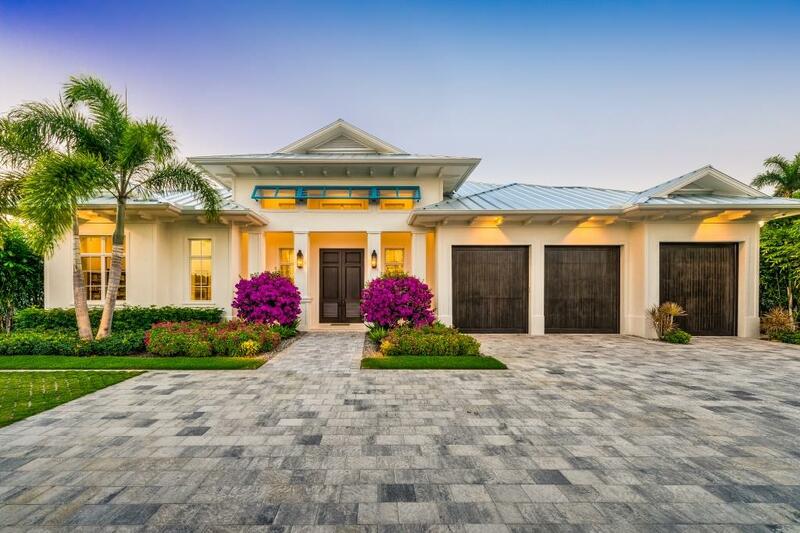 Custom home builder Knauf-Koenig Group is ready to unveil its latest home at 577 Devils Lane in the Park Shore neighborhood in the city of Naples. The two-story custom home is designed by Stofft Cooney Architects and furnished by Calusa Bay Design. Listed by Tim Scott of Equity Realty for $4.395 million, this home has an open floor plan that flows seamlessly to the outdoor living area offering lake views. It features four bedrooms plus a den, six bathrooms and a three-car-garage with 4,891 square feet of living space, all controlled by a Control 4 home automation system. The Davanti mahogany door opens to a grand entrance that features a vaulted ceiling with decorative beams and tongue-and-groove wood work, a Knauf-Koenig Group signature. To the right is a powder bath and den. To the left is a separate dining room with a full, custom-made bar in a driftwood finish. The kitchen's high-end finishes include Ruffino custom cabinets, Wolf and Sub-Zero appliances, and quartz counter tops. The kitchen and great room both open to the outdoor living areas via Andersen sliding glass doors. Rounding out the first floor is the private master suite with water views. The spa-like master bath includes a generous soaking tub, shower with glass mosaic tile, and a walk-in closet large enough for even the most dedicated fashionista. Walking through this home, you can immediately notice that Knauf-Koenig Group specifies only the finest products in their homes. Glass interior door transoms, a premium Andersen 400 Series window package, and Legno Bastone wide plank wood flooring in the St. Moritz style are just a few more of the many fine points that illustrate Knauf-Koenig Group’s attention to detail. The white oak staircase to the second story leads to three guest rooms with en suite bathrooms and walk-in closets. The two guest bedrooms at the back of the house share a covered balcony that overlooks the pool, spa and lake. The front guest room has its own balcony and acts as a VIP guest suite. The outdoor living area offers a tranquil setting with lake views. The pool, spa and fire pit are surrounded by landscaping designed by architect Kevin Schafer Landscape Design. Rounding out the outdoor living experience is a Lynx grill and bar that seats four. Calusa Bay Design, a luxury boutique interior design firm in Naples, furnish this custom home. In keeping with the home's British West Indies style, the team chose a coastal transitional elegance with soft spa colors throughout. This neutral palette complements the homes wide plank wood floors, millwork, and floor-to-ceiling windows, which flood the home with natural light. Interesting textures and pops of color complete the look. This Park Shore custom home offers a great location, lifestyle, and built with quality construction. For information, visit www.kkgbuild.com, www.calusabaynaples.com or www.stofft.com. People called Calusa Bay Development crazy for knocking down a home in Pelican Bay to make room for a brand new custom home; but it worked. And it has continued to work. Now on their fifth and sixth projects together, with a seventh to follow soon after, the team of Calusa Bay Development, builder Knauf-Koenig Group and the architectural firm Stofft Cooney seem to have found their niche in Pelican Bay and have raised the bar for luxury living in one of Naples original planned communities. Ready for immediate occupancy is a custom home at 704 Hollybriar Lane. It has 5,500 square feet under air and is set up for the entertainer or for those who enjoy the Naples lifestyle of indoor-outdoor living. This estate home comes with an open concept floor plan featuring three living areas with vaulted, tongue-and-groove cypress ceilings, floor to ceiling windows, wide-plank washed oak floors and Knauf-Koenig Group’s signature woodwork throughout. 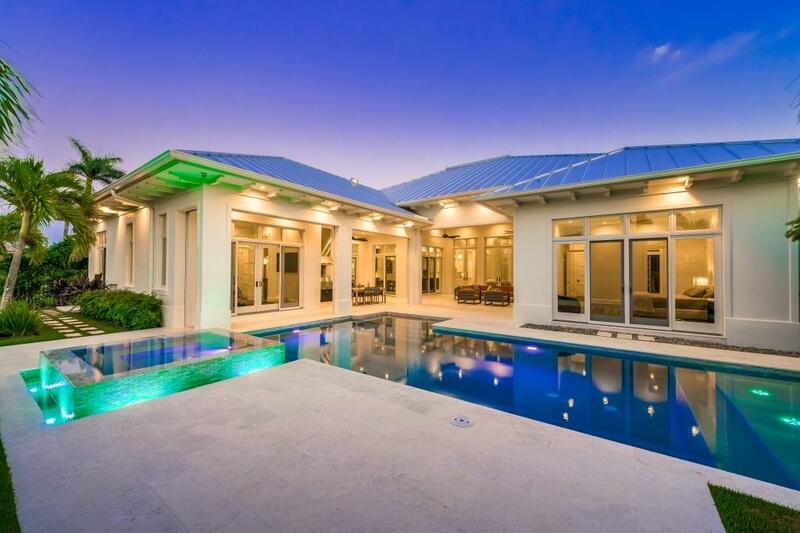 Recently published in Florida Design magazine, this custom home is the new standard for luxury living in Pelican Bay. As you enter this home through the bleached mahogany custom front door, your eyes immediately focus on the great room’s glass wall that overlooks the 45-foot lap pool and adjoining spa flanked by fire bowls. The west wing of the home features a guest room with an en suite bathroom, a laundry area, a separate dining room, and a luxurious kitchen and family room that flow into an outdoor living area complete with remote controlled screens and shutters, a fireplace, television, outdoor kitchen and al fresco dining all in a private, lushly landscaped tropical oasis. 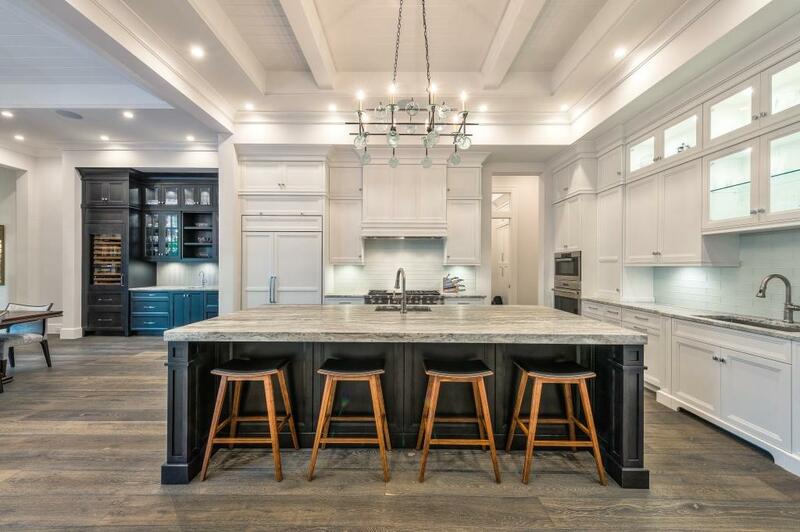 The well-appointed chef’s kitchen features custom floor-to-ceiling cabinetry, a 126-inch island, butler’s pantry and Sub-Zero and Wolf appliances. The east side of the home offers two additional guest rooms with en suite bathrooms, a den and a master bedroom with a spa-like bathroom that features custom cabinetry in a driftwood finish, Kohler fixtures and a freestanding cast-iron soaking tub. A view of the pool and spa from large windows completes the tranquil feel to the master suite designed in neutral tones. One street north of Hollybriar Lane is 702 Tamarind Court ,where currently Calusa Bay Development’s second project is underway and approaching completion. This lakefront estate home is designed to impress by Stofft Cooney Architects. The 5,100-square-foot under air home has an open concept floor plan featuring both an indoor and outdoor great room, a club room/office, four bedrooms, seven bathrooms and a three-car-garage. A Davanti custom made front door opens to the foyer that looks out through a 10-foot folding glass wall by Solar Innovations to the 50-foot lap pool, 8-foot infinity spa and a lake view. Wide plank Italian oak floors, beautifully crafted woodwork and floor-to-ceiling windows are prevalent in all of the bedrooms and throughout the home. The master suite overlooks the pool and has two complete en suite bathrooms with dressing room/closet. For the chef of the home, a lavish kitchen is complete with a butler’s pantry and breakfast nook as well as Sub-Zero and Wolf appliances, 2-inch mitered quartzite countertops and custom cabinetry. This home also features a Vantage lighting control system and pre-wiring for AV and sound that can be controlled by an iPhone. Impeccably furnished by Calusa Bay Design, no detail has been overlooked to create this custom dream home. Pelican Bay offers: 570 acres of mangroves and estuaries, 43 acres of parks, recreation areas, beachfront facilities and boardwalks, 3 miles of private beach with beachfront dining, 27 holes of championship golf and 18 Har-Tru tennis courts divided among two complexes. Slated for a summer completion, their new two-story clubhouse will provide enhanced experiences for members in all aspects of dining, golfing and socializing. Calusa Bay Properties is the broker. Online at www.calusabayproperties.com. Knauf-Koenig Group, www.kkgbuild.com, 5640 Taylor Road, Suite 3, Naples. Some say the real estate market is slowing down, but not for Matt and Gisela Knauf, owners of the Knauf-Koenig Group. The company has broken ground on six custom homes in the first quarter of 2017. The houses span from Pelican Bay south to Port Royal with retail prices ranging from $4 to $10 million. 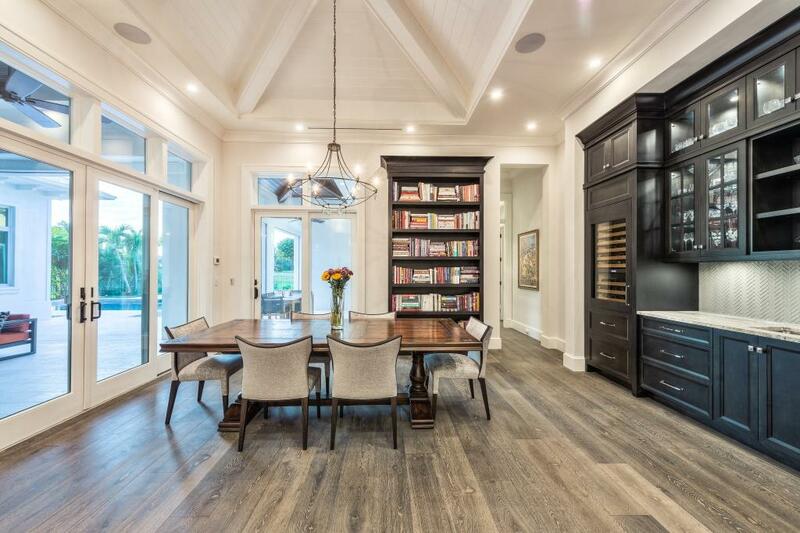 Naples based architectural firms, Stofft Cooney and Falcon Design, and interior design companies, Calusa Bay Design and Clive Daniel Home, are showcasing their talents on the custom homes that range from 5,000 square feet to more than 10,000 square feet. Each home will feature four to five bedrooms, six to seven bathrooms and a three-car-garage along with many luxurious finishes that have become synonymous with a Knauf-Koenig Group project. Theater rooms, libraries, wine cellars and even a fly fishing room are just a few of the amenities. Outdoor living areas will be vast at every home with the pool and spa being the main focus. Add to all of this alfresco dining, summer kitchens and fire pits, and the homes’ exterior will be as luxurious as their interior. With seven more homes well underway in the mid-construction phase, and seven recently completed, that puts the company in position to continue building off its 2016 record-breaking year. Having broken into the highly competitive Port Royal market was another big accomplishment and one that Matt Knauf believes could be a game changer for his company. "Getting the opportunity to build in Port Royal was huge for us. We’re very thankful and honored to be chosen by the homeowner to build their custom home. Hopefully it will be the first of many to come in the future," he said. Knauf-Koenig Group is one of the leading luxury homebuilders in Naples. As a licensed general contractor, they specialize in building one of the finest custom homes in the area. They have seen a steady rise over the past two decades to the top of their sector.